This Cranberry Pear and Apple Crumble mixes large chunks of apples and pears with tart cranberries (either fresh or dried), and tops them with a streusel-like mixture made with flour, brown sugar, ground cinnamon, rolled oats, nuts, and butter. It is oh so good when served warm from the oven with a scoop of vanilla ice cream. While I've called this dessert a 'Crumble', it's also known as a 'Crisp'. These two names are really interchangeable because they both come from the fact that when you pull this dessert from the oven you will notice how wonderfully 'crumbly' and 'crisp' the topping has become. Crumbles and Crisps are especially popular during the Fall and Winter months which just happens to coincide with the harvest times of pears, apples, and cranberries. There are many choices for what type of pears and apples you can use in this dessert. I normally use Bartlett, Bosc, and/or Anjou Pears. While Granny Smith, Golden Delicious, Rome and Braeburn are some year round favorites, try to use locally grown apples as they have superior flavor and texture, with the added bonus that you're supporting your local farmers. You can even use a couple of different varieties of apples and pears which gives the Crumble a wonderfully complex flavor. Also, the cranberries can be either fresh or dried. 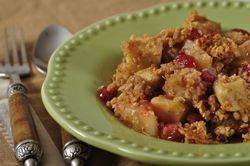 This Cranberry Pear and Apple's crumble topping contains old fashioned rolled oats. Oats are a cereal grain that is rich and flavorful and comes in many forms. Very popular in Northern Europe, Scotland and Ireland. Oats to be consumed by humans are cleaned, toasted, hulled to become what we call oat groats. The oat groats are then steamed and flattened to become rolled oats. There are two types, old fashioned and quick cooking. My personal preference is to use old-fashioned rolled oats because their texture is thicker. Cranberry Pear and Apple Crumble: Preheat your oven to 375 degrees F (190 degrees C) and place rack in the center of the oven. Butter, or spray with a non stick cooking spray, a 9 inch (23 cm) deep dish pie plate or an 8 x 2 inch square (20 x 5 cm) baking dish. For Filling: Peel, core, and cut the apples and pears into large chunks and place them in a large bowl. Add the dried cranberries, along with the sugar, salt, and cornstarch (if using) and toss to combine. Transfer to your baking dish and then spread the topping evenly over the fruit. Bake for approximately 35 - 45 minutes or until bubbly and the topping is golden brown and crisp. Remove from oven and place on a wire rack to cool for at least 15 minutes before serving. Serve with vanilla ice cream. Leftovers can be covered and stored in the refrigerator.